The presented application is one of the standard monitoring services performed by ISE srl in the field of Tissue paper industry. ISE srl is an Italian company operating in the field of Reliability, Maintenance Consulting, PdM and Condition Monitoring. 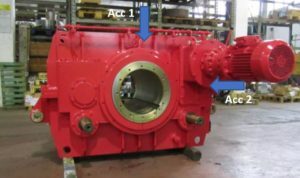 The activity is focused on monitoring the Yankee gearbox for Tissue paper machine (Figure 1). 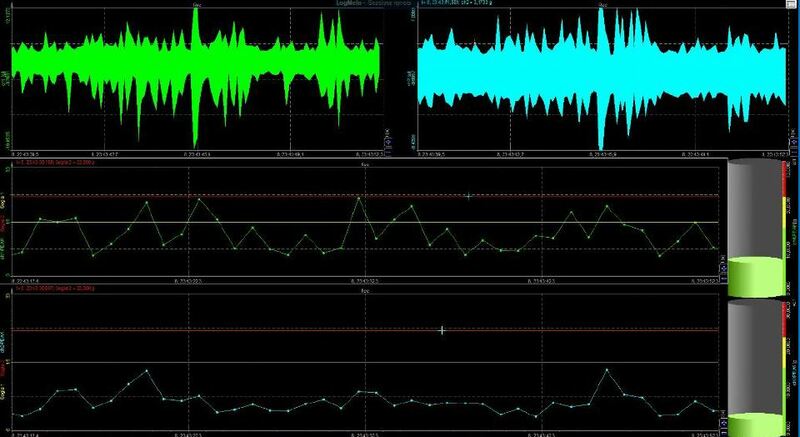 The activity consists in monitoring the behavior of Yankee gearbox along two specific directions using two IEPE accelerometers. The measuring activity is averagely performed for one/three months, for that reason a standard system is designed to be installed for a medium-long time and then be used without significant changes in the same or in another kind of application. In order to design a flexible and general-purpose acquisition panel, which can be able to cover every possible measuring activities on the mentioned machine and environment at the same time, a system with small dimensions, flexible number of channels input and an easy software configuration is required. A standard configuration is composed of: sensors and cables, an acquisition box and a remote-control channel. Figure 3 – Acquisition box. (A) Monodaq unit, (B) Power over Ethernet injector, (C) Power units, (D) Rugged PC with wi-fi channel. For such technical specifications, DEWESoft data acquisition software software and MonoDAQ EtherCAT measurement hardware were selected as a flexible solution to be implemented in a box which can be easily re-configured, in both hardware and software parts, basing on the activity that has to be performed. Monodaq are EtherCAT modules with several possible interfaces: IEPE, strain gauge amplifier, digital inputs, digital outputs, analog output, wide range voltage input. In the presented application four IEPE interface module have been installed. Moreover, those modules were upgraded with 40KS/s firmware, which allows the module having a 3dB bandwidth @20kHz. Another significant feature is the EherCAT cabling solution. 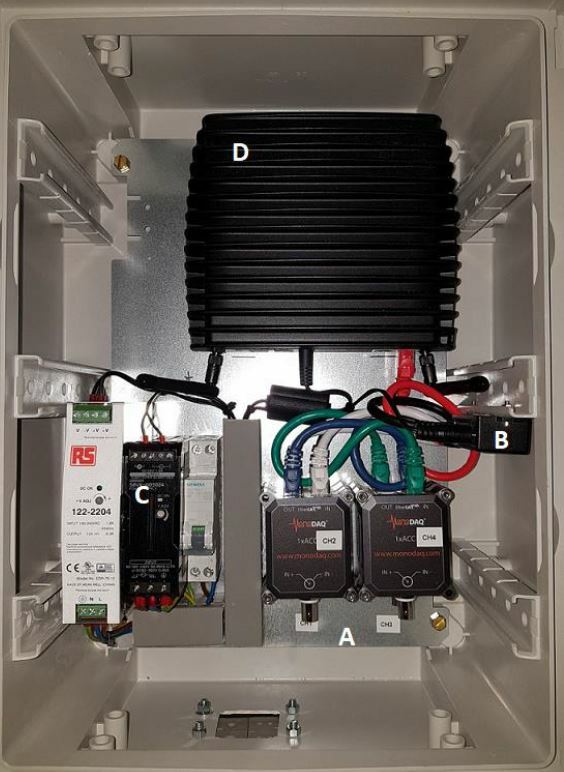 Thanks to that, basing on the application, it is possible to install the modules outside the box close to the sensors in order to save money in cabling with UTP cable instead of analog cable. Single channel instruments are daisy chained by an affordable network cable which provide signal and powering. In the following figure a setup overview of Yankee gearbox monitoring is shown. Figure 4 plots the time signals of accelerometers and the trend of 0-peak value. Using two thresholds in combination with DEWESoft Send mail plugin it is possible to receive e-mails alert for dangerous gearbox working conditions.